The list of prime-time dramatic TV shows that have made it to 300 episodes is relatively short. Classic westerns like Gunsmoke. Your Law & Orders and CSI types. ER at 331 episodes. And now, Grey’s Anatomy, a show that inevitably evokes the response, “Is that still on?”, joins this vaunted list. Because that’s just not enough, trapped in the roller coaster car that somehow gets wheeled into the hospital are doppelgangers for long-lost George (Greg) and Christina (Chloe), followed by a pregnant Izzie (Liza). There’s even a hero who prevented the coaster accident from being even worse, shades of the heroic Derek Shepard. Meredith decides to bypass the frickin’ Harper Avery awards to stay and tend to fake Christina. It’s the parable of her entire life: Meredith has always put medicine, and her “people,” above everything else. Still, the fake Izzy, George, and Cristina don’t really have the impact that Rhimes must have hoped they’d have, even though we see their effects on Meredith, Bailey, and Alex. In fact, their presence just highlights the lack of appearances in the episode by anyone we would actually care about. Three hundred episodes, and they couldn’t get Katherine Heigl, who does cat litter commercials now? T.R. 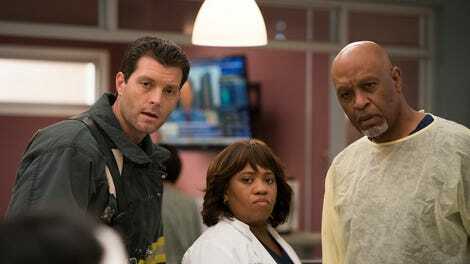 Knight, who appeared on The Catch, another Shonda show? A brief spot by Patrick Dempsey, or Chyler Leigh or Eric Dane? They couldn’t get Sandra Oh to even record a few lines for a frickin’ phone call? Maybe it was a case of, if you can’t get everyone, why bother, so the many departed characters are left to mysterious musings by the surviving cast members. Arizona fondly impersonating Mark Sloan, of all people. Amelia saying that Derek somehow led her to do a life-saving CAT scan on the hero. Jackson’s speech accepting the award for Meredith (“Meredith Grey has suffered more loss in her life than most of us would deem fair”), acknowledging the deaths of Lexie, and Derek, and her mother. Meredith winning the elusive Harper Avery is hardly a surprise, and that award has never meant as much to the people who watch the show than its life-and-death stakes to the characters on it. In fact, wasn’t the whole reason Cristina left the hospital in the first place that she could never actually win the Harper Avery while working at Grey Sloan? But the win is highlighted by the visage of the proud Ellis Grey looking own at her (hey, they got Kate Burton to show up), with Ellis’ much earlier nasty pronouncement of Meredith as “ordinary” now wiped out forever. Without any meaningful flashbacks or other guest stars, what we’re left with is a lower-tier Grey’s episode. I haven’t tuned in to this season since we stopped doing discussion board posts for the show after last year, but it was disappointingly easy to catch up and realize I hadn’t missed a thing. Bailey and her husband are still fighting, as are now-divorced Owen and Amelia. DeLuca has an old flame that is part of the new, forgettable intern crop. Arizona is getting Sofia back. And honestly, that’s about it. For longtime fans, the episode did contain some swoonworthy moments: the original credits, for example. 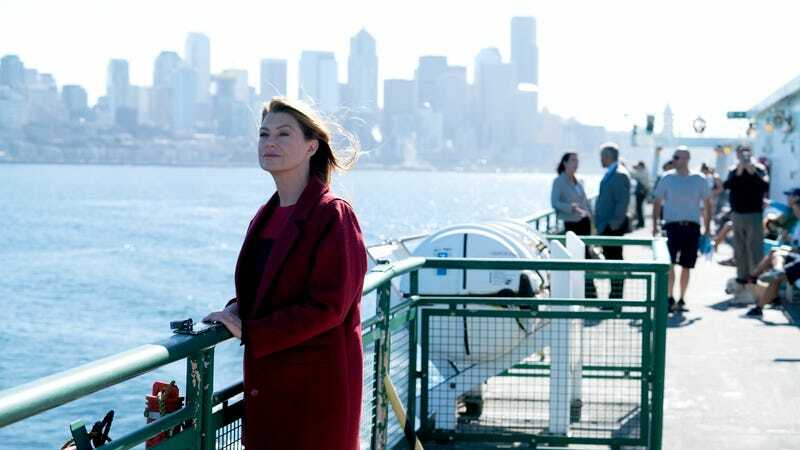 Meredith starting the episode on the ferry with Alex, so that she can talk to Derek. Various familiar songs from the Grey’s soundtrack, especially episode one. Alex picking up Liza the same way he picked up Izzie after Denny died. Little Zola talking about how she wants to grow up to be a brain surgeon like her dad. Meredith starts out by saying that even though surgeons are scientists, there is something else they believe in. The episode ends with a nice line, about how “history and memory and the ghosts of our past are sometimes just as tangible as anything we can hold in our hands.” Lacking the actual portrayers of these lost characters, these ghostly Easter eggs do an admirable job of reminding us how the show is still steeped in its history, even as it tries to foist a new intern class on us every fall. And the fact that this is a women-fueled show, especially in today’s TV landscape, is definitely not insignificant. Neither is its now-historic longevity: By reaching three hundred episodes, surrounded by “why is this still on” haters, Grey’s is definitely filling a need somewhere for viewers, still attracting eight million viewers a week—even as it storylines recycle and its characters get caught in repeating plots and it seems like we’ve seen this whole thing before. In tonight’s episode, we actually had—like Alex and Meredith kicking the interns out of their old tunnel, so they could hang out just as they did in the show’s earliest days—but at least this time, it was intentional.